The Brandenburg Stone is a memorial stone of national significance for the 220 thousand victims in North America of the Comet Catastrophe of 536/540 AD. The Comet already exploded near the Sun in 531. Two parts of the debris reached the Earth several years later. The whole event resembled the previous Krakatau Catastrophe, of 416, as well as the probably simultaneous eruption of Rabaul Volcano, in 540. The climate in America was seriously disrupted for more than one and a half years (18 months). Daylight was strongly dimmed, it did not rain anymore, and it was bitterly cold. Most casualties occurred within a time period of nine years. A quarter of the original population of 4.0 million men in North America migrated to the Rivers for food and fresh water, in order to survive. The Stone was carved in 560 AD, 24 years after the start of the Catastrophe. The petroglyph contains an ancient Welsh script called Coelbren, which is deciphered by two British researchers, Wilson and Blackett. It turns out to be an important Christian prayer.- The petroglyph shows there were 2.9 million casualties worldwide (5.5%). This number includes the c.120 thousand victims of the eruption of Rabaul Volcano. The Stone also gives excellent descriptions of the Biblical Flood, the Dardanus Flood, Caesar’s Comet, and the eruption of the Krakatau Volcano. - The Biblical Flood of 2344 BC was a two-stage event, which lasted for 2 + 2 = 4 months. There were 2.6 million casualties (54%), and 2.2 million survivors. The precipitation was 9 m of water. It was the start of a time period of more than three centuries of chaos, until the Twelfth Dynasty.- The Dardanus Flood of 1159 BC was also a two-stage event, which happened 35 years after the appearance of the Comet. It lasted for 40 + 40 = 80 days. There were 3.8 million casualties (21%), and 2.0 million victims because of system collapse (11%). So, in total there were 5.8 million casualties (32%). There were 12 million survivors. The precipitation was 5.5 m of water. It was the start of a time period of four centuries of chaos. - The disaster caused by Caesar’s Comet in 44 BC happened two months after perihelion. It resembled a volcano catastrophe, and lasted for two years. There were 500 thousand casualties (1.3%).- The Krakatau Catastrophe of 416 AD lasted for one year. There were 250 thousand casualties, worldwide (0.5%). - The carving predicts a possible Comet Catastrophe in the year of c.2256. In 1912 Mr. C. Crecelius found a carved limestone slab while plowing his field near Battletown, Kentucky (figs.1,2).1-3 The original slab, which later broke into three fragments, had a width of 21 inches, a maximum height of 15.5 inches, and a thickness varying from 1 to 3 inches. The flat front side of the Stone bears a linear carving extending over its entire width. In total, it consists of about thirty characters. The average height of the main symbols is 0.86 inches. Both width and depth of the carved lines are on the average 0.12 inches. The village of Battletown, where the slab was found, is located on the south bank of the Ohio River, at 38oN, which is in the north of Meade County (fig.4). It is situated thirteen miles northwest of the town of Brandenburg, and about thirty miles southwest of the city of Louisville. The Brandenburg Stone is presently on display in the Public Library of Charlestown, Clark County, Indiana, which is north of Louisville. Reading from left to right, they proposed the following translation: "Towards strength (to promote unity) divide the land we are spread over purely (justly) between offspring in wisdom." It is a significant statement, and they considered it further proof that Welsh people lived in the area around Louisville in the sixth century AD. The Stone was found in Meade County, at 38oN, which is also the latitude of the Azores Archipelago in the middle of the North Atlantic Ocean. The complementary latitude corresponds to South Wales (Milford Haven), at 90o-38o = 52oN. In antiquity the use of complementary latitudes was very common.5-11 It appears to confirm the origin of the carver of the Stone, and the people who inhabited the area. 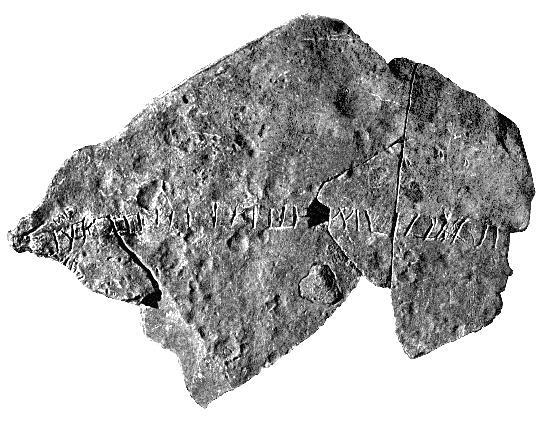 The inscription contains a pentagon, a regular geometric figure with five angles (fig.5). It may encode a date of 500 AD. It also contains a hexagon, having six equal angles (fig.6). It may encode a date of 600 AD. The presence of both figures point to a time period between both dates. It appears to confirm the sixth century AD, as mentioned by Wilson and Blackett. It provides an approximate date for the carving on the Brandenburg Stone. 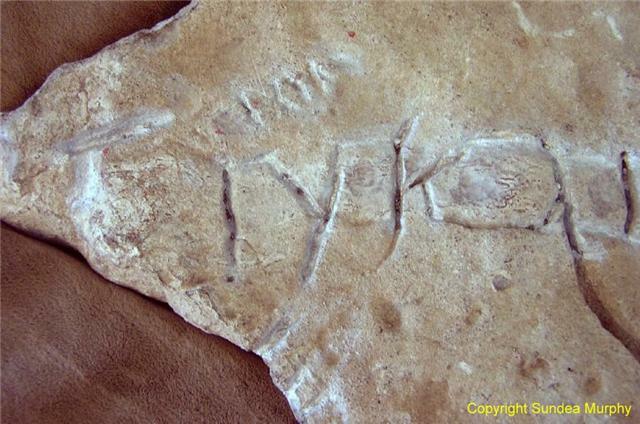 There are more vertical strokes among the characters on the Stone than used by the men who deciphered it (fig.3). However, the translation of the vertical stroke reads “towards”, and such a word may be omitted in the final text. The hexagon at the left side is not translated either (fig.6). The three symbols before it mean “Towards strength”. It is well known that “cells of bees” in beehives have the shape of hexagons. These are made of wax, forming rows besides and on top of each other in a kind of plate. The hexagon is the shape giving maximal strength to an open construction, which was apparently known at the time the inscription was made. So, the hexagon simply confirms and emphasizes the meaning of the symbols before it. The upper edge at the right side of the Stone symbolizes the Ohio River, where the stone was found. The upper edge at the left side represents the Mississippi, from the confluence with the Ohio to the Gulf of Mexico. The lengths of both edges do not exactly match the distances, but that is less important. These features may suggest, that a major flood or drought occurred. The entire petroglyph is a large Arrow, which points southwest, ending in the Mississippi Delta. It is slightly bended, following the curvature of the surface of the Earth. It might refer to a Catastrophe descended from the east, from the direction of the rising Sun. The pentagon and the hexagon show that the numbers five and six are important. So, the Arrow points to the Delta, at 5x6 = 30oN. 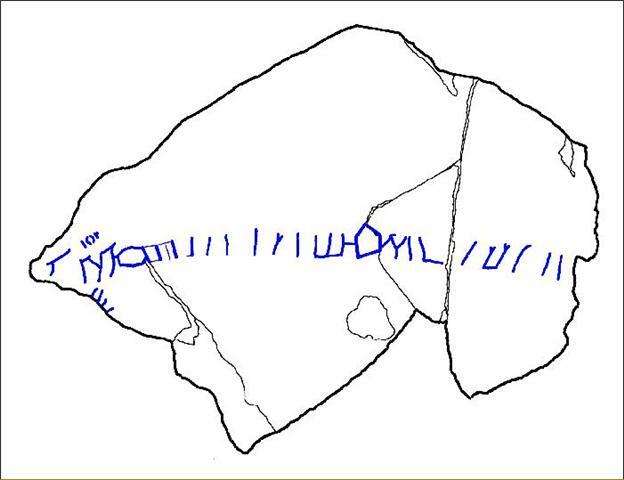 The eight words of the Coelbren text confirm it, eight degrees below the finding spot of the Stone, at 38 - 8 = 30oN. The Arrow itself has five groups, each consisting of about six symbols. Two of these groups have joined characters. The group at the extreme left side is special, because it also contains small symbols. Together with the latitude of the Mississippi Delta, at 30oN, it encodes the circumference of the planet Earth: 30 + 6 = 36 Egyptian Moiras, or 360o. It may indicate that it was a worldwide Disaster. The six vertical strokes in the midsection, and the W sign behind it (might be equal to thirty, attached to the pentagon), appear to confirm it, 6 + 30 = 36 Moiras. The 5x6 = 30 symbols and the hexagon confirm it, again. This linear part consists of four groups of six symbols, together 4x6 = 24 symbols. The large symbol of the end group at the left side means “Towards”. Together these symbols refer to the Comet Catastrophe which ended the Fifth Dynasty of Egypt (and the Old Kingdom), c.2400 BC (a number of four figures). This dynasty is represented by the pentagon. The event is also known as the Flood or the Deluge. It is symbolized at the start of the Arrow, considered as a time scale, at the right side.12-15 - The linear part also consists of two groups of 2x6 = 12 symbols, twice referring to the Comet Catastrophe which ended the Twentieth Dynasty of the New Kingdom, c.1200 BC. This dynasty is confirmed by the 20 characters of the Coelbren text. The Disaster is known as the Dardanus Flood. This event is best symbolized by the center of the linear part of the Arrow, considered as a time scale (after the W-sign). The carving suggests both Catastrophes and the present one are all three caused by the same Comet! Each group of six symbols appears to encode the Period of this historical Comet, c.600 years. The three clusters of the end group show it is a number of three figures. The five groups of symbols would date the present Catastrophe to (5x600)-2400= 3000-2400= c.600 AD, which is roughly correct. This event is symbolized by the tip of the Stone, behind the large symbol, at the left side.- The pentagon dates the appearance of the Comet to approximately 500. The five groups of symbols confirm it. These point to the Mississippi Delta, at 30oN, suggesting a better date of c.530. The very first symbol at the left side appears to give the correct date, at 531 AD. This date is mentioned, calculated and confirmed by the famous physicist Isaac Newton (1643 -1727). He could also use later data of the same Comet, when it apparently returned in 1106 and 1681. It appears his conclusions were approved by the English government and the Church in the 17th century. However, the Period of this Comet is smaller than 600 years. An accurate date for the Biblical Flood is c.2344 BC (tree-ring dating). It means the Period of the Comet is (2344+531)/5= 575 years. The carving contains 25 large symbols, confirming this Period of 600 - 25 = 575 years. This famous Comet is a so-called sun-grazer. The first symbol at the left side consists of two pieces of line. These suggest the Head of the Comet exploded near the Sun. The long upper line represents the main part of the Head, which continued its course. It points to a group of four small signs. The first sign represents the Comet when it approached the Sun, the second and third signs depict the Sun, and the last sign confirms the event. It is a kind of split sign, which shows the explosion took place after perihelion (on the way back).- The first symbol at the left side consists of two pieces of line. These now suggest the explosion produced two dangerous parts of the Comet, also represented by the lower and upper group, respectively. The four groups of the linear part of the Arrow represent four consecutive years of the Catastrophe, from 537 to 540. The last group at the right side is special, because its symbols are leaning to the right. They point to the carving of the Comet, suggesting an additional effect from it. The upper line of the first symbol, at the left side, points to the upper group of four small signs. Both represent the second dangerous part of the Comet, also consisting of a number of stones (meteorites). The first sign of the small group represents the first part of the Comet, when it had burnt to dust in the atmosphere in 537, the second and third signs depict the Earth, and the last sign is the second dangerous part of the Comet, when it entered the atmosphere in 540. It corresponds to the last group of the linear part of the Arrow, at the right side. It is believed that almost all stones of both groups turned to dust, causing a serious corruption of the atmosphere for a prolonged period of time. The five groups of symbols represent the ‘five years’ of the Comet Catastrophe, from 536 to 540. The first three groups of the linear part appear to indicate that three quarters, or 75%, of the Catastrophe was caused by the event in 536. The two groups of joined symbols confirm this calamity consisted of two stages, the second one in the last year of 540, when the weather was extremely cold and dry, and when most casualties occurred. The symbols of the last group, at the right side, are leaning to the right, which means that one quarter, or 25%, of the Catastrophe was caused by this second event in 540 AD. Note, that the left side of the Stone has the shape of a huge Volcano. The Arrow now represents the tube, which leads the hot magma from the interior of the Earth to the surface. The deeply carved line from the hexagon to the lower edge of the Stone confirms this process. It is clear, the carver wanted to show this Calamity strongly resembled a Volcano Catastrophe. It was completely different from the ancient Catastrophes caused by the same Comet, both of these being Floods. The local shape of the Ohio River, between Otter Creek Park in the east and Cloverport in the west, at a distance of 35 miles, resembles a Volcano, too (fig.4). The Brandenburg Stone was found near the top of it. The groups of the Arrow each consist of 6 symbols, all encoding the latitude of Krakatau Volcano between the islands of Java and Sumatra, Indonesia, at 6oS. A deeply carved line from below points to the hexagon, confirming it. The lower side of the Stone resembles the South Coasts of India and SE Asia. The Arrow now points to the Nile Delta in Egypt, also at 30oN. The Coelbren text has 8 words, encoding the position of the Volcano, 8 Moiras east of the Nile Delta, when measured along the equator. The linear part of the Arrow consists of two large groups, each of 12 symbols, twice encoding the date of the eruption, 120 years before the Comet Catastrophe, at 536 - 120 = 416 AD. The end group has three small clusters, confirming the 3 figures of this number. The four groups of the linear part also encode the latitude of Rabaul Volcano, on the northeastern end of New Britain Island, Papua New Guinea, at 4oS. The 5 groups of the Arrow, and the pentagon, each encode its position, 5 Moiras east of the Krakatau Volcano. The four groups of the linear part also encode the date of its Eruption, 4 years after the start of the Comet Catastrophe, at 536 + 4 = 540. It had a VEI index of 6. It probably coincided with the second event of the Comet Catastrophe, also in 540 AD. The dangerous Rabaul Volcano has a caldera with a diameter of about 5 miles. A carving of the Volcano is shown below the pentagon (top view, figs.1-3). Its huge Eruption of 540, producing a lot of “rubble”, is confirmed by carbon dating.- Note, that at a distance of only 13 miles NW of the Volcano is Watom Island, which has the shape of a pentagon. If possible, all interpretations of the petroglyph will closely follow the known literature about the Comet Catastrophe.46-50 The two large groups of twelve symbols show it was a two stage event. The two groups of joined symbols appear to confirm it. The special group at the left side, as well as the first group of the linear part, each start with the same character, meaning “Towards”. These appear to symbolize the two huge explosions at the start of both impact events, in 536 and 540, respectively. The two vertical strokes at the right side, after the Coelbren text, confirm it. The latitude of the Delta, at 30oN, corresponds with the thirty days of the month. The pentagon and the hexagon confirm these 5x6= 30 days. The three successive groups containing both geometric figures encode the first three months after the start of the Catastrophe in 536 AD, when the stars could not be seen anymore at night.57 These groups contain a total of 3x6= 18 symbols, corresponding to the eighteen months when the light of the Sun was strongly dimmed, because of large amounts of dust in the air.34-37,51,52,57 The height-ratio of the Stone and its symbols equals 15.5/0.86= 18 (see above), confirming these eighteen months. It had terrible consequences for the climate. The linear part of the Arrow has four groups containing 4x6= 24 symbols, encoding the four hours of feeble sunlight per natural day of 24 hours.34,47,49 This time period slowly finished in the year of 536+1.5= c.538 AD, which is symbolized by the location of the Stone, at 38oN. It is confirmed by the central group of vertical strokes (see above). The second group of joined symbols at the right side confirms this location, too. The W-sign, the pentagon, and the three other symbols encode the latitude of Meade County, at 30o + 5o + 3o = 38oN. Note, that the first three months, mentioned in ancient literature, consist of 3x30= 90 days, referring to the Volcano’s around the equator, at the complementary latitude of 90o - 90o = 0oN. This Comet Catastrophe strongly resembled a Volcano Catastrophe. Note also, that the eighteen months, which are mentioned, contain 18x30= 540 days, referring to both the second impact event and the Eruption of Rabaul Volcano, in 540 AD. Chaotic situations caused by “supernatural powers” are often described by magical relations, which do not exist in reality. The cluster around the hexagon contains six symbols. Together with three vertical strokes of the next group (note the spacing behind it), these form 6 + 3 = 9 units, encoding the time period of nine years after the start of the Catastrophe, when most casualties occurred (536-544 AD).34-37,46-49 The group of six joined symbols around the pentagon, and the three strokes at the left side of it, confirm these 6 + 3 = 9 years. This time period is mentioned in ancient literature. The linear part of the glyph contains 4x2= 8 subgroups, confirming the last year of 536 + 8 = 544 AD. Meade County is located at the level of the nine islands of the Azores, which may confirm the nine years, too. The linear part of the glyph has four groups of about six symbols, encoding 4x6= 24 years. It means, that the consequences of the worldwide Catastrophe were followed until 24 years after the start of it, in 536 AD. So, the carving is accurately dated at 536 + 24 = 560 AD. The Coelbren text contains twenty symbols, corresponding to the twenty years after the second event and the Eruption of Rabaul Volcano, when most casualties occurred, confirming the date of 540 + 20 = 560 AD. The pentagon and the hexagon are part of three successive groups, confirming it, again, at 560 AD (a number of three figures). In order to determine the total number of casualties in North America, the Roman numbers in the Arrow should be traced from right to left (fig.3). (6 or 5xI)+L+M should be read as five hundred, plus five hundred, plus one thousand. The pentagon shows the resulting number should be written in five figures. So, this part of the petroglyph encodes a total number of 20 thousand victims.- Next, W(=M)+(10xI) should be read as one thousand, plus one thousand. The hexagon shows the resulting number should be written in six figures. So the second part of the petroglyph encodes 200 thousand victims. Thus, the Brandenburg Stone is a memorial stone for the 220 thousand victims in North America of the Comet Catastrophe of 536/540 AD. At the left side of the hexagon are two symbols, both pointing to two normal, and two short strokes on the lower edge. Together with the hexagon and the pentagon these small symbols confirm the 200 thousand (six figures) + 20 thousand (five figures) = 220 thousand casualties. The linear part of the petroglyph has two groups with joined symbols, and two groups with separate symbols, confirming it. The whole petroglyph consists of two large parts in the linear section, and two small parts in the end section, at the left side, confirming it, again. 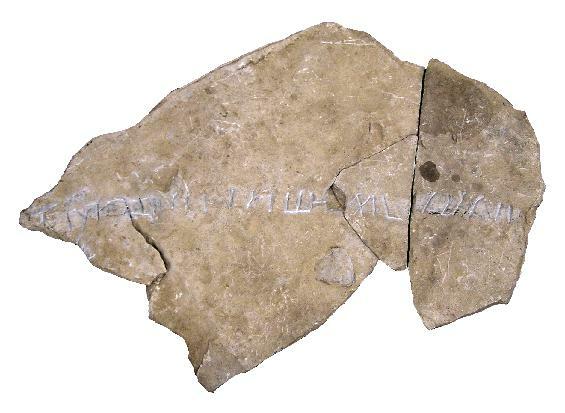 The Coelbren text on the Stone has a total number of twenty symbols. Together with the hexagon and the pentagon the total number of casualties in North America is confirmed, once again. - The whole petroglyph suggests, that most American victims were found in the southeastern part of the United States. The traditional symbol for a Comet is Greenland as the Head of the Comet, and the North Atlantic Ocean as its Tail.12,13 Meade County is located 60o - 38o = 22o below Cape Farvel, the south cape of Greenland, confirming the 220 thousand victims. Its latitude, at 60oN, confirms the 6 figures of this number. The meridian of Meade County, where the Stone was found, hits the north coast of Yucatan, Mexico, at 22oN, confirming the number of victims. It also hits the north coast of Honduras, 38 - 16 = 22o to the south, confirming it, again. Both second and third characters at the left side each point to a stroke on the edge (fig.6). Together with the hexagon, and the extra, faint line in this group, these encode two million casualties worldwide (a number of 6 + 1 = 7 figures). The two small strokes on the lower edge indicate that an additional group should be used. So, the next 3 + 6 = 9 strokes, and the hexagon, encode an additional nine hundred thousand casualties (a number of six figures). The first character at the left side means: “Towards”. So, there were almost 2.9 million casualties worldwide. The Roman numbers at the right side of the pentagon confirm the two million victims (see above). The nine strokes at the left side of it, until the group with the hexagon, confirm the nine hundred thousand additional victims. The Coelbren text contains twenty letters forming eight words, suggesting 2.8 million casualties. However, the special group at the left side has the additional word of “Towards”, confirming the 2.9 million casualties, worldwide. Note, that the contribution of Rabaul Volcano of about 4% (see above) is included. It corresponds with c.120 thousand casualties.- All these victims turn out to be 5.5% of the world population.58 Note also, that this percentage lies between the important numbers 5 and 6, which are indicated on the Stone. The height-ratio of the symbols and the Stone equals 0.86/15.5 = 0,055 (see above), confirming this percentage. According to a source in the literature.47,53: “John of Ephesus documented the plague’s progress in AD 541-542 in Constantinople, where city officials gave up trying to count the dead after two hundred thirty thousand.” It gives an idea of the scope of this Catastrophe. Eventually, it would result to the so-called Dark Ages, a time period of misery that lasted for several centuries.- The Arrow points to the Mouth of the Mississippi River, at 29oN. It contains 4 + 3 = 7 groups. It confirms the 2.9 million casualties, worldwide (a number of 7 figures). It also points to the Delta, at 30oN, indicating the approximate number of c.3 million men. The first three symbols before the hexagon, and the additional line, confirm the circa 3 million casualties, worldwide. The W-sign attached to the pentagon, confirms the 30x105 = c.3 million victims, again. The pentagon itself indicates the c.50 million survivors (a number of 3 + 5 = 8 figures). The pentagon and the three additional symbols of the group refer to the original world population before the Comet Catastrophe (and the Eruption of Rabaul Volcano), c.53 million men.58 The 3 + 2 = 5 symbols of the group at the right side confirm the number of survivors, c.50 million. The five groups of the Arrow and the eight words of the Coelbren text confirm it, again. Based on the situation in the rest of the World, there were about (50/2.9)x0.22= 3.8 million survivors in North America.- The hexagon, and the symbol which coincides with it, form together 6 + 1 = 7 units. The three symbols before the hexagon, and the eight remaining strokes after it, confirm the 3.8 million survivors (a number of seven figures). The W, the pentagon, and the three additional symbols form together 30 + 5 + 3 = 38 units, confirming it, again. The latitude of Meade County, at 38oN, where the Brandenburg Stone was found, confirms it, once again. There were about 3.8 + 0.2 = 4.0 million men in North America before the Catastrophe. The four groups of the linear part confirm the original population of 4.0 million men. It consists of two long groups, each of four subgroups, twice confirming it. The four symbols before the hexagon (and the symbol which coincides with it) appear to confirm it. The first cluster at the right side consists of four strokes, confirming it, again. The worst features of this Catastrophe were severe drought, very cold weather, crop failure, and famine for more than three decades. The whole petroglyph is a big Arrow which runs from the Ocean over the Appalachian Mountains to the Mississippi Delta. The Delta was an area having fresh water, a humid soil, and a relatively mild climate. So, the Arrow symbolizes a massive migration of people in North America towards the Rivers and River Delta’s of the continent, trying to get some fresh water and a little bit of food in order to survive. The Brandenburg Stone was found near the Ohio River, which appears to confirm it. The linear part of the Arrow consists of four groups. The last group contains the hexagon, and the symbol which coincides with it (fig.6). It represents the 4.0/4= c.1 million men (a number of 7 figures), who migrated to these areas (25%). The first group of symbols is leaning to the right. The rest of the Arrow consists of four groups, again. The last group, at the left side, confirms the number. It represents the Delta itself, which symbolizes these areas. It contains one big symbol, again confirming the number of people (c.1 million). It means “Towards”, stressing its approximate value. The whole Arrow has 4x6 + 1 = 25 big symbols, confirming the c.25% of the original population of 4.0 million men. All these men and women migrated to the Rivers and River Mouths in order to survive this Catastrophe. The translation of the Coelbren script by Wilson and Blackett reads (fig.3): "Towards strength (to promote unity) divide the land we are spread over purely (justly) between offspring in wisdom." In the light of the mass migration of about a quarter of the people of North America towards these areas with water (and food), this text gets a very special meaning. On the average, each family consists of two parents and two children. One of the parents, or preferably one of the children, had to migrate. So, it simply confirms this mass migration! The Brandenburg Stone is a memorial stone of national significance for the 220 thousand victims in North America of the Comet Catastrophe of 536/540 AD. It was a worldwide Catastrophe with 2.9 million casualties (5.5%). The world population decreased from 53 to 50 million men. However, it also contains a strong, religious message. - The Stone is an important document for the prehistory of the World. It should be protected and displayed in an important Archaeological Museum in the United States, where it was also found. The linear part of the Arrow consists of four groups of six symbols, together 4x6 = 24 symbols. The large symbol of the end group at the left side means “Towards”. Together these symbols refer to the Comet Catastrophe which ended the Fifth Dynasty of Egypt (and the Old Kingdom), c.2400 BC (a number of four figures). The pentagon, but also the five groups of the Arrow, each represent this Fifth Dynasty. The event is symbolized at the start of the Arrow, considered as a time scale, at the right side. The two vertical strokes along the edge suggest two stages of about equal duration. The Arrow points to the Mississippi Delta, at 30oN. This latitude indicates the 30 days of the month. The two groups of symbols at the right side correspond to a time period of two months, when the planet Earth was inside the Tail of the Comet. The falling stones were causing horrible forest-fires, and the melting ice resulted in torrential rains and worldwide floodings. It was completely dark on Earth.- The two groups at the left side correspond to two months after it. The climate was completely disrupted. The terrible rains continued, but it also became very cold. So, the rains changed into ferrocious snow and hail storms. Each of the long groups contain 2x6 = 12 symbols, twice confirming the duration of the Catastrophe, 120 days. The three clusters of the end group confirm the 3 figures of this number. The four groups consist of 4x2 = 8 subgroups. Together, these encode the world population before the Catastrophe of 4.8 million men (a number of 7 figures). The two groups at the right side, and six subgroups at this side, encode the number of casualties, 2.6 million men (54%). The two groups at the left side, and the two remaining subgroups at this side, confirm the number of survivors, 4.8 - 2.6 = 2.2 million men. Most of them were seriously injured. - Note, that the last symbol of the second subgroup (I) is the sixth letter of the Coebren text, representing the Sixth Dynasty. It also represents the 1st king Teti (c.2370-2338 BC). It happened during his reign. The five groups of the Arrow, and the four groups of the linear part, confirm the percentage of victims, 54%. The two groups at the left side, and six subgroups at this side, confirm the number of casualties, 2.6 million men (54%). The two groups at the right side, and the two remaining subgroups at this side, confirm the number of survivors, 4.8 -2.6 = 2.2 million men. Note, that the six symbols of the last subgroups are leaning to the right. These represent the survivors in the Sixth Dynasty. The first subgroup at the extreme right side confirms the 1st king Teti. The two strokes confirm his 30 + 2 = 32 years of reign. The five groups of the Arrow, and the four groups at the left side, confirm the percentage of victims, 54%. The last group at the right side consists of five symbols, and the cluster with the U-sign has four strokes. It confirms the percentage of 54%, again. The four symbols before the hexagon (and the symbol attached to it), and the eight remaining strokes (until the next group) represent the world population before the Comet Catastrophe, 4.8 million men (a number of 7 figures). The two symbols before the hexagon (and the symbol attached to it), and the two remaining symbols of the group, represent the number of survivors, 2.2 million men. Note, that the last symbol refers to king Teti of the Sixth Dynasty, again. The two long and two short strokes along the edge confirm the 2.2 million survivors. - The two symbols before the hexagon, and the six symbols after it, until the spacing, confirm the 4.8 - 2.2 = 2.6 million casualties. The first symbol of the linear part means “Towards”. The group with the pentagon may be considered as having four symbols, confirming the percentage of 54%. The Arrow consists of five groups of six symbols. These show the Flood ended the Fifth Dynasty, and it happened in the Sixth Dynasty. The group with the pentagon has a total of six symbols, confirming it. The pentagon and the hexagon confirm it, once again. - The first group of six symbols at the left side is special. The large symbol confirms the 1st king Teti of the Sixth Dynasty. The two small clusters confirm his 30 + 2 = 32 years of reign. The group refers to a latitude of 30 + 6 = 36oN. It encodes the circumference of the planet Earth of 36 Moiras, which shows it was a worldwide Catastrophe. The complementary latitude of 90o - 36o = 54oN confirms the percentage of casualties, 54%. The first group of the linear part contains the hexagon. It confirms the 1st king Teti of the Sixth Dynasty, again. The Comet Catastrophe happened c.2344 BC (tree-ring dating). The linear part of the Arrow consists of 4x2 = 8 subgroups, encoding the precipitation during the Flood, 80 micromoiras = 80x0.11 = 9 meters of water. The pentagon and the W-sign represent 5 + 3 = 8 units, confirming the 80 micromoiras (a number of 2 figures). The Coelbren text contains 8 words, confirming it, again.- The linear part of the Arrow consists of two long groups of 12 symbols, twice encoding the time period of more than three centuries of chaos until the Twelfth Dynasty (c.2007 BC). The meridian of Meade County, where the Stone was found, hits the south coast of Lake Michigan, at 42oN. This is 42o - 38o = 4o to the north, encoding the total duration of the Biblical Flood, 4 months. This meridian runs from Lake Michigan to the Gulf of Mexico over 12oof land, confirming these 120 days.- Lake Michigan is 4o to the north, and the Gulf is 8o to the south, which corresponds to the initial world population of 4.8 million men. The complementary latitude of the south coast of Lake Michigan, at 90o - 42o = 48oN, confirms it. The width of North America at the level of Meade County is 48 moiras, or 48o, confirming it, too. The meridian runs from Hudson Bay to the Gulf over 56o -30o = 26o of land, encoding the 2.6 million casualties. The linear part of the Arrow consists of two long groups, each of 2x6 = 12 symbols, twice referring to the Comet Catastrophe in the Twentieth Dynasty of the New Kingdom, c.1200 BC (a number of four figures). This dynasty is indicated by the 20 characters of the Coelbren text. The 20th character is situated at the end of the last word FUR. Its symbols are leaning to the right in the direction of the carving of the Comet along the edge. It shows this Catastrophe was a so- called Flood. It did not resemble a Volcano Catastrophe, as illustrated at the other side. The 18th letter of the text is situated at the start of the word FUR. It is leaning to the right, because the danger of this Disaster was already recognized in the Eighteenth Dynasty. The 19th letter is leaning to the right, because the Comet appeared at the end of the Nineteenth Dynasty, in – (531-3x575) = c.1194 BC. It was during the reigns of king Siptah (1194-1188 BC) and his regent Queen Tausert (1194-1186 BC), who are represented by the two vertical strokes of this U-sign. Queen Tausert was the 8th ruler of this dynasty, as indicated by the 8th word FUR. The U-symbol also shows the Comet exploded near the Sun. A part of the Comet (the second stroke) reached the gravitational field of the planet Earth. It consisted of ice and stones. The 20th and last letter is leaning to the right, because this dangerous part entered the atmosphere in the Twentieth Dynasty. The word has three symbols, and the group a total of five. So, it happened 35 years after the appearance of the Comet, in 1194 - 35 = c.1159 BC. This year is confirmed by tree-ring dating. The Coelbren text contains five words of three letters, confirming this time period. The Arrow has five groups pointing to the Delta, confirming it, again. The 20th character of the text points across the spacing to two vertical strokes along the edge. These confirm the explosion, which created the dangerous fragment of ice and stones. However, the whole Arrow symbolizes the original Comet, and the special group at the left side represents the Head of it. The first large symbol consists of two pieces of line, illustrating the event. The horizontal line points to the upper group of small signs, which represents the main part of the Comet. It continued its course. The first small sign is the Comet when it approached the Sun, the second and third signs depict the Sun, and the last sign shows the explosion, again. It is a split sign, which illustrates the creation of the dangerous part. The three groups of the linear part at the left side contain 3x6 = 18 symbols, confirming the statement that this Catastrophe was already expected in the 18th Dynasty. The 19th symbol in the next group is leaning to the right, because the Comet appeared and exploded at the end of the 19th Dynasty. The 20th symbol is a U-sign, because the dangerous part of ice and stones caused the Catastrophe in the 20th Dynasty. It happened during the reign of the 2nd king. The third and last symbol of the cluster confirms it was Ramses III (1184-1153 BC). It happened at the end of his reign, in 1159 BC. The Coelbren text contains two words of two letters and many words of three letters, strongly confirming the 2nd king Ramses III. The last symbol points across the spacing to the two vertical strokes along the edge, and to the next symbol at the extreme left side, confirming the 2nd king Ramses III. This last symbol confirms his 30 + 1 = 31 years of reign. This special group contains two smaller clusters and the large symbol, again confirming the 2nd king Ramses III. The whole Arrow consists of two long groups and an end group at the left side, confirming it. The two groups with joined symbols, and the group in between, confirm the 2nd king Ramses III, again. The 20th symbol of the Coelbren text points across the spacing to the two strokes at the carving of the Comet, along the edge. These strokes suggest a two stage event. The 20th symbol itself is part of a cluster of four vertical stokes. So, it appears the first time period lasted for 40 days. The falling stones were causing horrible forest-fires, and the melting ice resulted in torrential rains and worldwide floodings. It was completely dark on Earth. The second time period lasted 40 days, too. The climate was completely disrupted. The terrible rains continued, but it also became very cold. So, the rains changed into ferrocious snow and hail storms. - It appears, the Catastrophe resembled the Biblical Flood of c.2344 BC. The whole event is best symbolized by the center of the linear part of the Arrow, considered as a time scale (see above). The W-sign and the pentagon confirm the Catastrophe occurred 30 + 5 = 35 years after the appearance of the Comet. The two strokes immediately to the left, and the third stroke after it, confirm it happened during the reign of the 2nd king Ramses III. The first stroke confirms his 30 + 1 = 31 years of reign. The two strokes confirm it was a two stage event. The second stroke is leaning to the right, in the direction of the carving of the Comet along the edge, which confirms it was a Flood. It did not resemble a Volcano Catastrophe, as illustrated at the other side. The four vertical strokes between this symbol and the pentagon confirm that both time periods each lasted 40 days. The linear part of the Arrow consists of four groups, confirming the time periods of 40 days. The two groups at the right side have four subgroups, confirming it. The two groups at the left side have four subgroups, too, confirming it, again. Together, these consist of 4 + 4 = 8 subgroups, encoding the total duration of the Comet Catastrophe of 80 days. The W-sign and the pentagon confirm the 3 + 5 = 80 days (a number of 2 figures). The Coelbren text contains 8 words, confirming it. The Brandenburg Stone was found 8o above the Mississippi Delta, at 30o + 8o = 38oN, confirming it, again. The last word FUR of the Coelbren text consists of four vertical strokes, leaning to the right. The first stroke may correspond to the 19th Dynasty, when the Comet appeared (see above). The second stroke encodes the 20th Dynasty of the Catastrophe. The third stroke might symbolize Dynasty 21 (1070-945 BC), and the fourth stroke may represent Dynasty 22 (945-712 BC). It shows, that the consequences of the Comet Catastrophe lasted to the end of Dynasty 22, more than four centuries after the event. The four vertical strokes confirm it. The 20th character of the Coelbren text points across the spacing to the two vertical strokes along the edge, which confirm the two mentioned Dynasties 21 and 22. The linear part of the Arrow consists of two long groups (each of twelve symbols). These confirm Dynasties 21 and 22, respectively. They contain together four normal groups (of six symbols), confirming the more than four centuries of chaos as a result of the Catastrophe. The event is best symbolized by the center of the linear part of the Arrow (see above). Immediately to the left of the pentagon and the W-sign is a straight, vertical piece of line, and to the right are a total of 3 + 5 = 8 symbols. It provides the world population before the Disaster of 10 + 8 = 18 million men (a number of 5 + 3 = 8 figures). The last symbol of the joined group is an L-sign, in this situation equal to five. So, instead of eight symbols only the first four symbols can be used, confirming the world population of 10 + 2 + 5 + 1 = 18 million men. The last symbol is now the 18th letter of the Coelbren script, which is leaning to the right. It confirms the original world population of 18 million men. The first three groups of the linear part contain two groups of joined symbols, which confirm the 2nd king Ramses III. These groups have a total of 3x6 = 18 symbols, confirming the world population, again. The Arrow consists of a large symbol at the extreme left side, and a linear part having 8 subgroups, confirming it. The Coelbren text possesses 1 word of one letter, and 8 words in total, which confirm the world population before the Catastrophe. It is a number of 8 figures. The U-sign at the right side is the 18 + 2 = 20th symbol of the linear part, encoding the Comet Catastrophe in the 20th Dynasty. The next symbol is the 20th letter of the Coelbren script, confirming it. Both symbols together refer to the reign of the 2nd king Ramses III, when it happened. These symbols are leaning to the right. It means, that the number of casualties is not determined by the pentagon, but by the hexagon and the extra, faint line in this group. So, it appears there were many victims! The last symbol points across the spacing to the two strokes at the right side, and beyond. It also points to the first three symbols of the linear part, before the hexagon and the faint line. It shows there were 2 + 3 = 5 million casualties (a number of 7 figures). The two slanting strokes of the U-sign have split ends on top. These refer to the slanting line in the midsection, having a split end, too. After the hexagon are a total of 6 + 2 = 8 vertical strokes till this slanting line, encoding an additional 8 hundred thousand casualties (a number of 6 figures). So, in total there were 5.8 million casualties (32%). It was the worst natural Disaster in human history. At the right side of the pentagon are a total of 3 + 5 = 8 symbols, confirming the number of 5.8 million casualties. The last symbol of the joined group is an L-sign, equal to five. So, instead of eight symbols only the first four can be used, confirming the number of victims, again 50 + 2 + 5 + 1 = 5.8 million men. The last symbol leans to the right, referring to the Comet Catastrophe. The Coelbren script contains 5 words of three letters, referring to the Calamity during the reign of king Ramses III. It has a total of 8 words, confirming the 5.8 million casualties. The whole Arrow consists of 5 groups with 8 subgroups in the linear part. Together with the hexagon, and extra faint line, these confirm the number of victims, again (32%). The Brandenburg Stone was made for the Comet Catastrophe of 536/540 AD, which caused 2.9 million casualties, worldwide. The two vertical strokes at the right side, as well as the U-sign, each indicate, that the Dardanus Flood of 1159 BC caused twice as much victims, 2x2.9 = 5.8 million victims. The two long groups of the linear part confirm it. The twenty letters of the Coelbren text confirm it, again. The last two letters of the Coelbren text consist of three strokes, which represent the 2nd king Ramses III. The last two strokes of these also represent the later Dynasties 21 and 22 (see above). The last symbol points across the spacing to the two strokes along the edge, both of these symbolizing the 2nd king as well as these two later dynasties. - It clearly shows, that the Dardanus Flood was different from the much earlier Biblical Flood (c.2344 BC). Besides casualties as a direct result of the Comet Catastrophe, there are now also victims because of system collapse (lack of government). The two vertical strokes along the edge represent 2 million victims because of system collapse (11%). The remaining 5.8-2.0 = 3.8 million casualties were the direct result of the Catastrophe (see above, 21%). Before the hexagon, and the extra faint line, there are a total of 1 + 3 = 4 large symbols, confirming these c.4 million casualties. The Coelbren text has twenty letters. The two strokes at the extreme right side, and the very first symbol at the left side, add to a total of 20 + 2 + 1 = 23 symbols, referring to the holy Tropic of Cancer, at 23oN, and the Egyptian Sunreligion. It emphasizes the importance of good government! After this enormous Calamity there was political chaos around the Mediterranean, and elsewhere, for a long time. The W-sign, the pentagon, and the three symbols after it confirm the 30 + 5 + 3 = 3.8 million casualties of the Catastrophe. The W-sign and the eight symbols after the pentagon confirm it. When the L-sign is counted as five, the W-sign and the first four symbols after it confirm it, again: 30 + 2 + 5 + 1 = 3.8 million men. The pentagon and the two strokes before it show it is a number of 5 + 2 = 7 figures. The four strokes before these confirm the c.4 million casualties of the Catastrophe. The Coelbren script contains many words of 3 letters. In total there are 8 words, confirming the 3.8 million victims. The last word FUR of the Coelbren text consists of four strokes, confirming these c.4 million men. These strokes are leaning to the right in the direction of the Comet glyph along the edge. The linear part of the Arrow consists of 8 subgroups each of 3 symbols, confirming the 3.8 million victims. It also consists of four groups, confirming the c.4 million people, as well as the four centuries of chaos. The right half has four subgroups, confirming it. The left half also has four subgroups, confirming it, again. These groups each have 12 symbols, referring to the Comet Catastrophe, at c.1200 BC. The Brandenburg Stone was found in Meade County, Kentucky, at 38oN, confirming the 3.8 million casualties of the Dardanus Flood. The hexagon shows there were a total of about 4 + 2 = 6 million casualties. The whole Arrow consists of groups of 6 symbols, strongly confirming it.- The two long groups of 2x6 = 12 symbols confirm the 18 - 6 = 12 million survivors, twice. The name of ‘Dardanus’ means Third, because it was the Flood, in which about one third of the people died, one third of these because of system collapse. Most of the survivors were seriously injured. The two groups of joined symbols have a total of 6 + 6 = 12 symbols, confirming the 12 million survivors. The Coelbren text has a first word of 1 letter, and a second word of 2 letters. In total there are 8 words, confirming the 12 million survivors (a number of 8 figures). The moira is a unit of length which is descended from the Nile Delta in Egypt, at 30oN. It is equal to 1 degree of latitude, or 111 kilometers. The Coelbren text has five words of 3 letters, referring to this unit. The 5 words show, that the precipitation during the Dardanus Flood was 50 micromoiras = 50x0.11= c.5.5 meters of water. The Arrow has a total of 10 subgroups, each of these consisting of 3 symbols, again referring to the Egyptian unit of length, the moira. However, the same Arrow has 5 groups, confirming the precipitation. The third group of the linear part, counted to the right, has a W-sign attached to the pentagon. The W-sign has 3 strokes, referring to the moira, again, and to king Ramses III. The pentagon confirms the precipitation of the Dardanus Flood, 50 micromoiras of water (a number of two figures). The meridian of Meade County, where the Stone was found, runs from Lake Michigan to the Gulf over 12o of land, referring to the Dardanus Flood of c.1200 BC. The Arrow points to the Mississippi Delta, at 30oN, referring to the reign of king Ramses III, when the Catastrophe happened. The width of the continent at this level is 35 moiras, or 35o, because it occurred 35 years after the appearance of the Comet. Lake Michigan is located 4o above Meade County, referring to the time periods of 40 days. The Gulf is 8o to the south, encoding the total duration of the Disaster, 2x40 = 80 days. The meridian of the Delta runs to Isle Royale, Lake Superior, over 18o of land, corresponding to the initial world population of 18 million men. The traditional symbol for a Comet is Greenland as the Head of the Comet, and the North Atlantic Ocean as its Tail. Meade County is located at the level of the Central Azores, at 38oN. Its five islands correspond to the precipitation during the Catastrophe, 50 micromoiras, or 5.5 meters of water. Its latitude encodes the 3.8 million casualties. The nearest important latitude line of Meade County runs towards Corvo, West Azores, at 40oN, corresponding to the four centuries of chaos after the event. It is 60o - 40o = 20o below Cape Farvel, the south cape of Greenland, encoding the 2.0 million additional victims because of system collapse. Cape Farvel is located at 60oN, corresponding to the c.6 million casualties of the Dardanus Flood. The meridian of Meade County runs from Lake Michigan to the Gulf over 12o of land, confirming the 12 million survivors. In antiquity the area around the south point of the Gulf of Campeche, Mexico, was called the Realm of the Dead (or Punt). Its latitude, at 18oN, symbolizes the initial world population of 18 million men. It is located 38 - 18 = 20o below Meade County, confirming the additional 2.0 million victims of system collapse after the Dardanus Flood. Note, that the Arrow appears to indicate the direction to the large archaeological site of Poverty Point, NE Louisiana. 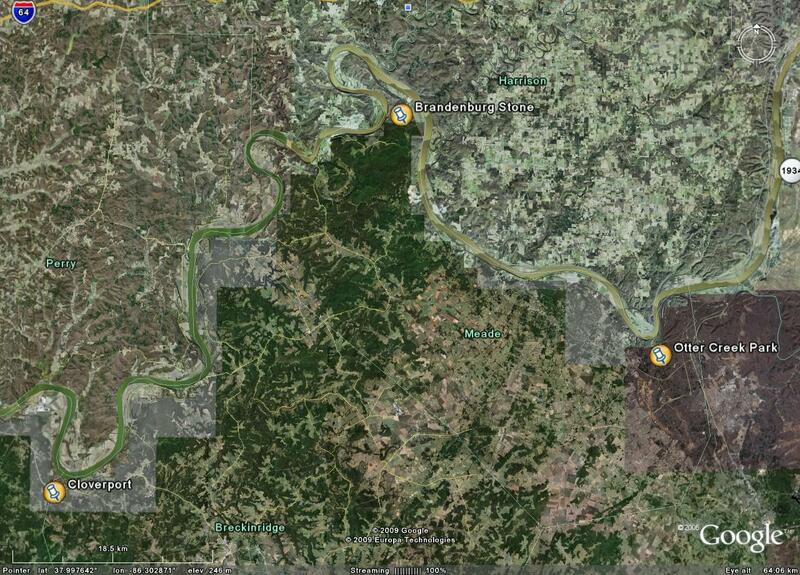 Its five groups encode its location, at 38o - 5o = 33oN, 5 moiras west of Meade County. It is built on Maçon Ridge, an oblong plateau of 5 to 90 miles (8 to 140 km), oriented to the north, in the middle of the flood-plains of the Mississippi River. This plateau has the shape of a huge Comet, and the site is founded because of the Comet Catastrophes, which struck the Americas so badly. The Arrow has five groups pointing to the Mississippi Delta, at 30oN. The first symbol at the extreme left side encodes the date of appearance of the Comet, in 500 + 30 + 1 = 531 AD. This character is part of the first group of six symbols, corresponding to c.600 years. However, the Periodicity of the Comet is slightly smaller, 575 years (see above). So, the previous appearance of the Comet was in - (531 - 575) = 44 BC. The Catastrophe in this year is best symbolized at the left side of the linear part of the Arrow, considered as a time scale, just before the first symbol. It is close to the left edge of the Stone, so it resembled a Volcano Catastrophe. The Comet (a sun-grazer) was first spotted in China. It exploded near the Sun. The first symbol at the left side consists of two pieces of line. The long upper line represents the main part, which continued its course. It points to a group of four small signs. The first sign represents the Comet when it approached the Sun, the second and third signs depict the Sun, and the last sign confirms the event. It is a kind of split sign, which shows the explosion took place after perihelion (on the way back). The cluster of lines along the lower edge represents the dangerous part. It appears to be a group of stones (meteorites). This debris reached the Earth two months later, as reported from Italy. The linear part of the Arrow consists of two long groups, corresponding to these two months. The Coelbren text and the linear part confirm the two months. These have a total of 20 + 24 = 44 characters, confirming the year of 44 BC. This year is mentioned in ancient literature, and confirmed by tree-ring dating and ice core samples. So, the start of the Arrow, at the extreme right side, symbolizes the Catastrophe, too. The Arrow, which points to the Delta, has a total of 30 symbols, confirming the 30 + 30 = c.60 days. The two clusters of the group at the left side confirm it. The two vertical strokes at the right side confirm the two months, again. It was a Comet Catastrophe, as illustrated along the edge. Features of the Disaster included large amounts of atmospheric dust, cold weather, drought, crop failure, and famine. It lasted for two years. The two long groups of the linear part confirm it. The 20 letters of the Coelbren script confirm it. The two vertical strokes at the right side confirm it. The linear part consists of 4 groups of 6 symbols, confirming the 4x6 = 24 months. These four groups encode the world population of 40 million men before the Catastrophe. The pentagon and the W-sign confirm the 5 + 3 = 8 figures of this number. The two long groups each contain four subgroups, twice confirming it. - The U-sign at the right side confirms the two years duration of the Calamity. It is part of a cluster of four strokes, confirming the 40 million people before it happened. The four groups at the left side of the Arrow, and the mentioned cluster of four strokes at the right side, confirm the date of 40 + 4 = 44 BC. The whole Arrow contains 4 + 3 = 7 clusters, encoding the reign of the Egyptian pharaoh Cleopatra VII (51-30 BC). The four strokes of the cluster at the right side, and the three symbols at the right side of the pentagon, form together 4 + 3 = 7 signs, confirming it. The L-sign, meaning five, and the two symbols after it, confirm the 5 + 2 = 7 units. The long group at the left side, and the end group, contain together 4 + 3 = 7 subgroups, confirming it, again. The latitude of the Delta, at 30oN, encodes the last year of reign of Cleopatra, at 30 BC. The first stroke at the left side of the pentagon encodes her first year of reign, at 30 + 6 + 6 + 6 + 3 = 51 BC. It was also the first year of reign of her co-ruler Ptolemy XIII (51 - 47 BC). The last stroke of the W-sign represents the year of 49 BC, when the Roman dictator Julius Caesar (49 - 44 BC) started to reign in the West. The next vertical stroke is the year of 48 BC. Together with the long group at the right side it forms 12 + 1 = 13 symbols, representing Ptolemy XIII. The next, split sign represents the next co-ruler Ptolemy XIV (47-44 BC), and his first year of reign, in 47 BC. Together with Cleopatra VII he reigned for three years. She is represented by the first stroke behind the gap (in 45 BC), which is the 7th stroke after the pentagon. The short, slanting stroke after it was the last year of Ptolemy XIV, in 44 BC. It was the year of the Comet Catastrophe. The Roman dictator Julius Caesar was killed, and Ptolemy XIV died, too. Now, there are five strokes till the hexagon, encoding 500 thousand casualties, worldwide (a number of 6 figures, 1.3%). Many people were injured. The 14th letter R of the Coelbren script, which represents Ptolemy XIV, is attached to the left side of the pentagon. It confirms the number of casualties (a number of 1 + 5 = 6 figures). The great emperor Julius Caesar died after 49 - 44 = 5 years of reign, at the age of 100 - 44 = 56, twice confirming it. The pentagon and the hexagon confirm it, too. The long stroke at the right side of the gap is also important. It is the third piece of line after the long group of 12 symbols, encoding the next co-ruler of Cleopatra, Ptolemy XV Caesarion. He was a son of Julius Caesar, and the casualties occurred during his reign. There are five strokes till the pentagon, and the line closely attached to it, confirming 500 thousand casualties (a number of 5 + 1 = 6 figures). The 15th letter S(Y) of the Coelbren script, which represents Ptolemy XV, is attached to the right side of the bottom of the pentagon. It strongly confirms the number of victims. The Coelbren text has 5 words of three letters, confirming it, too. Fig.7 The present Krakatau Volcano in the middle of Sunda Strait between the islands of Java in the east and Sumatra in the northwest. During the Eruption of 416 AD this new Sea Strait was created, having a diameter of about 70 miles. 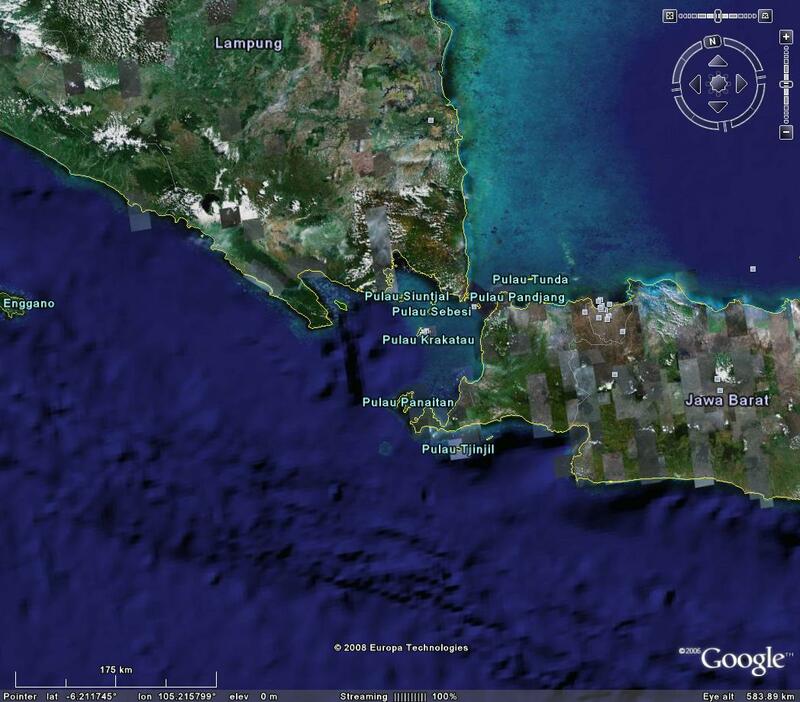 Besides all the land, a part of the Earth Crust in Sunda Strait disappeared, having a diameter of c.40 miles, more than a mile deep (Google Earth). The pentagon, the Mississippi Delta, and the first group at the left side encode together the start of the Comet Catastrophe in 500 + 30 + 6 = 536 AD. However, it strongly resembled the previous Catastrophe of the Krakatau Volcano. Note, that the first group at the left side resembles the top of the Volcano, as shown by the left edge of the Stone. The long group at the left side has twelve symbols, encoding the date of this Volcano Catastrophe, 120 years earlier, at 536 - 120 = 416 AD. It appears to be the correct date reported in the literature. It also contains the hexagon, which refers to the latitude of this Volcano, at 6oS. So, the center of the linear part of the Arrow, considered as a time scale, symbolizes the Krakatau Catastrophe in the best way. This linear part is the tube of the Volcano. So, the strokes will be counted to the left in the direction of the magma flow. The first stroke after the W-sign is a vertical piece of line, which appears to encode the duration of the event, about 1 year. The long group has twelve symbols, confirming the 12 months. The group at the extreme left side corresponds with the circumference of the planet Earth, 30 + 6 = 36 Moiras, which shows it was a worldwide Catastrophe. Features included large amounts of atmospheric dust, cold weather, drought, crop failure and famine. The long group at the right side has twelve symbols, confirming the date of the Calamity, 536 - 120 = 416 AD. The first vertical stroke at the right side confirms its duration of about 1 year. The twelve symbols of the group confirm the 12 months. The large symbol at the extreme left side of the Arrow confirms the duration of about 1 year, again. It symbolizes the crater of the Volcano. The first word of the Coelbren text has only 1 letter, confirming it, again. The second stroke in the mid-section has a split end on top, and it is leaning to the right. It appears to encode 2 hundred thousand casualties. The hexagon determines the six figures of this number. The fifth stroke in the mid-section is also leaning to the right. It corresponds to an additional 50 thousand casualties. The pentagon takes care for the five figures of this number. So, in total there were 250 thousand casualties (0.5%). The pentagon also encodes the initial world population of c.50 million men. Together with the W- sign, it corresponds to the 5 + 3 = 8 figures of this number. In a previous article the Catastrophe of 536/540 AD was thought to be caused by the eruption of the Krakatau Volcano. This turns out to be wrong. The error was mainly caused by the very prominent left edge of the Stone, which strongly resembles a Volcano, as well as the local shape of the Ohio River, which resembles it, too. However, the message was meant in a different way: the features of this Comet Catastrophe were like the eruption of a Volcano, which is a different thing, of course. Another reason for the mistake is the rather weak carving of a Comet along the edge at the right side. It appears, that in the time period when the Brandenburg Stone was made, the true origin of this Catastrophe was common knowledge. However, this knowledge has completely disappeared in the mist of time.- The true nature of this Disaster is also obvious from the mentioned date of the Krakatau Catastrophe in the literature, more than a century earlier: 416 AD. This is a rather solid piece of information, which is generally not considered to be in doubt. The Brandenburg Stone shows this date to be correct. The petroglyph emphasizes the role of a historical Comet, which influenced human civilization in a profound way. Baillie suspected the existence of a whole series of Catastrophes by this single Comet, but he failed to get sufficient recognition of this idea by his audience.28-30 - The Periodicity of this Comet is c.575 years. The Brandenburg Stone shows the Comet appeared in 531 AD. It means, that simple calculation provides a series of dates which might be linked to important historical events. Calculation shows the Comet appeared in 2919 BC, which coincides with the end of the First Dynasty of Egypt, c.2922 BC. The official reason for the end of this dynasty is presently unknown. So, it opens up a whole series of interesting speculations. The Comet appeared again in 2344 BC, which coincides with the date of the Biblical Flood. The Comet clearly is the cause of this Flood. It ended the Fifth Dynasty, and after a while the Old Kingdom. All other civilizations on Earth were terminated as well. In Egypt it was the start of the First Intermediate period (FIP).- The Comet appeared again in 1769 BC, which is c.24 years after what appears to be the best date of the end of the 12th Dynasty of the Middle Kingdom, c.1793 BC. The reason for the end of the Middle Kingdom is presently unknown, but it is highly probable this Comet was involved. It was the start of the Second Intermediate Period (SIP). The Comet appeared again in 1194 BC. This time the Catastrophe happened 35 years after the appearance of the Comet, as a result of cometary debris in the solar system. The Dardanus Flood ended the Twentieth Dynasty of the New Kingdom, and it resulted in the start of the Third Intermediate Period (TIP). Many other civilizations in the World disappeared at the same time.- The Comet appeared again in 619 BC. It appears, that for the first time people on Earth were rather lucky. A cosmic collision with the tail of the Comet, or with debris from this object, did not occur. However, it returned in 44 BC. For the first time it resembled a Volcano Catastrophe. It ended the Ptolemaic Dynasty, and it was the beginning of the time period of the Roman Emperors. Actually, it coincided with the birth of the Christian Era, in which we are presently living. 5. Whitfield, J.A., “The Meade County Messenger”, Brandenburg, Kentucky, 1997, Ref.1. 9. Fell, B., America BC, Pocket Books, Simon & Schuster, 1994 (ISBN 0-671-67974- 0). 10. Bailey, J., Sailing to Paradise, Simon & Schuster, 1994 (ISBN 0-684-81297- 5). 11. Thompson, G., American Discovery, Misty Isles Press, Seattle, 1994 (ISBN 0- 9612990-4-4). 14. De Jonge, R.M., “Discovery of America and the Flood (c.2300 BC, Ita Letra, Villarrica, Paraguay)”, Ref.8, to be published. 15. De Jonge, R.M., “The Discovery of Australia and the Flood (The Rainbow Serpent Shelter, Mt. Borradaile, Arnhem Land)”, Ref.8, to be published. 19. Ramsey, J.T., and Lewis Licht, A., The comet of 44 B.C. and Caesar's funeral games, The American Philological Association (1997). 20. Whiston, W., New Theory of the Earth (1696). 28. Baillie, M.G.L., New Light on the Black Death: The Cosmic Connection, Ed. Tempus (2006). 31. Baillie, M.G.L., “Dendrochronology raises questions about the nature of the AD 536 dustveil event.”, The Holocene 4 (2), 212-217 (1994). 32. Baillie, M.G.L., A Slice Through Time: Dendrochronology and Precision Dating, Routledge, London (1996) (ISBN 0-713-47654-0). 33. Baillie, M.G.L., Exodus to Arthur, Catastrophic Encounters with Comets, BT Batsford Ltd., London, 1999 (ISBN 0-7134-8681-3). 36. Wohletz, K.H., “Were the Dark Ages triggered by volcano-related climate changes in the 6th century?”, EOS Trans. Amer. Geophys. Union, 48 (81), F1305 (2000). 38. D'Arrigo, R., Frank, D., Jacoby, G., and Pederson, N., “Spatial Response to Major Volcanic Events in or about AD 536, 934 and 1258”, Climatic Change 49, 239-246 (2001). 40. Biot Report #214: “Did a Krakatoa Eruption in 535 A.D. Help Precipitate the Decline of Antiquity and the Spread of Islam?” (2005). 42. Larsen, L.B., et al., “New ice core evidence for a volcanic cause of the A.D. 536 dust veil”, Geophys. Res. Lett., 35, L04708 (2008). 44. Stothers, R. B., and Rampino, M. R., Science 222, 411?413 (1983). 45. Stothers, R.B., “Mystery Cloud of AD 536”, Nature 307, 344-345 (1984). 47. Van Douwen, W.J., and Land, J.P.N., “John of Ephesus Ecclesiastical History”, transl., 297? 298, Muller, Amsterdam (1889). 48. Encyclopedic Almanac, 1970, The New York Times, 1970, 388. 49. De Boer, J.Z., and Sanders, D.T., Volcanoes in Human History: the Far-Reaching Effects of Major Eruptions, Princeton N.J., Princeton Univ. Press (2001). 50. Salzer, M.W., and Hughes, M.K., Quaternary Research 67, 57-68, 2007. 59. Peiser, B.J., Palmer, T., Bailey, M.E., Natural Catastrophes during Bronze Age Civilizations, BAR International Series 728, Oxford, 1998 (ISBN 0-86054-916- X). 60. Peiser, B.J., “Evidence for a Global Disaster in the Late 3rd Millennium BC”, Ref.59, pgs. 117-140. 61. Baillie, M.G.L., “Hints that Cometary Debris played some Role in several Tree-Ring Dated Environmental Downturns in the Bronze Age”, Ref.59, pgs.109-117. 62. Courty, M.-A., “The Soil Record of an Exceptional Event at 4000 BP in the Middle East”, Ref.59, pgs.93-109. 63. Clube, S.V.M., and Napier, W.M., The Cosmic Serpent, Faber and Faber, London, 1982. 64. Clube, S.V.M., and Napier, W.M., The Cosmic Winter, Blackwell, Oxford, 1990. 65. Joseph, F., Survivors of Atlantis, Their Impact on World Culture, Bear & Co., Vermont 2004 (ISBN 1-59143-0-040-2). 66. Grondine, E.P., Man and Impact in the Americas, Kempton, Illinois (2005) (ISBN 0-9776 -152-0-0). 68. Bruce Masse, W., Earth, Air, Fire, and Water, The Archaeology of Bronze Age Cosmic Catastrophes, Ref.59, pgs.53-92. 69. De Jonge, R.M., “Four Ancient Stories (Poverty Point, NE Louisiana, c.700 BC)”, Ref.8, to be published. 70. De Jonge, R.M., “The Myths of Monks Mound (Cahokia, Illinois, 650-1400 AD)”, Ref.8, to be published.